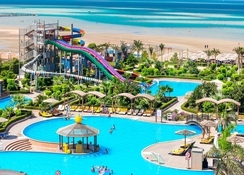 Sitting stylishly on the Red Sea coastline of the Sinai Peninsula in Hurghada, Hawaii Caesar Palace Hotel & Aqua Park is a little paradise for the holidaymakers looking to spend some fun time with family and friends. Spend the day relaxing on Hawaii Caesar Palace Hotel & Aqua Park private beach or have fun at the waterpark for free before returning for a meal at one of the hotel’s four excellent restaurants. The hotel features stunning 484 air-conditioned guestrooms with private balconies where you can take in sea views. The hotel is a smart modern resort with a wealth of facilities within the hotel, including outdoor swimming pool, outdoor and indoor sports, social bars, a kids’ club and nightly entertainment programmes, to keep you happy and engaged. 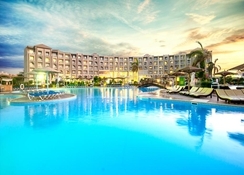 So, just book your place now and look forward to terrific holidays in Egypt. 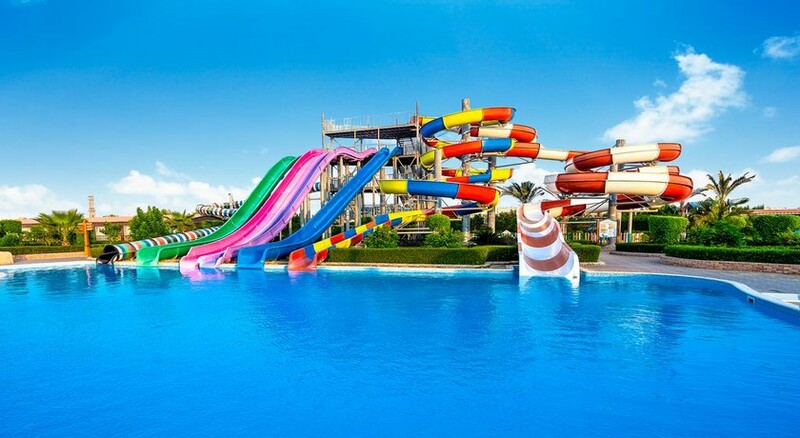 Hawaii Caesar Palace Hotel & Aqua Park is located in Hurghada, within the region of El Gouna Beach and New Marina. Situated on the shoes of Red Sea, the hotel offers an exotic beachscape views. The nearest shopping centre 10 km away from the hotel. While Hurghada Marine Museum & Aquarium is just 5 km from the property, there are a number of dive spots located not too far away. you can find plenty of café and restaurants outside the hotel. The hotel is 10 km from El Gouna and 15 km from Hurghada city centre. The nearest airport of Hurghada is 16 km from the hotel. 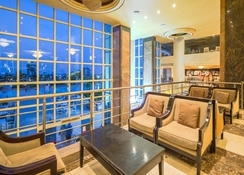 The hotel features 484 well-equipped rooms with bright cheerful decor, comfortable furnishings and modern conveniences. Broadly categorised into Stnadard Double Rooms, Standard Triple Rooms, Family Rooms and Bungalows, the accommodation units feature private furnished balcony with sea, pool or garden views, air-conditioning, en-suite bathroom with hair dryer, satellite TV, telephone, mini bar and safe box. The main restaurant serves buffet-style for breakfast, lunch and dinner. The hotel also offers special diet meals (upon request), packed lunches and BBQ facilities. You can find arrange of bars, including lobby bar, snack bar, pool bar, beach bar, plus disco and entertainment team with programme. For something extra, there are plenty of restaurants, cafes and bars located nearby. You just need to book a taxi from the reception, or simply rent a car and explore the exotic eateries located in Hurghada. The hotel has a lot to offer, especially when it comes to keeping their guests happy and engaged. There are two swimming pools with loungers and parasols, a private beach with water sports facilities, a waterpark with free entry, a health club (with reservations, 16+), international dive centre, windsurfing centre and aqua centre. Other than that, there is table tennis, beach volleyball, football field, darts, billiards, aerobics, and animation team – the list is never ending! The hotel’s spa and wellness centre offers massage, hot tub/Jacuzzi, sauna, Turkish/steam bath, Fitness centre and beauty salon. For your little ones, the hotel offers a kids’ pool, a playground and kids’ club. 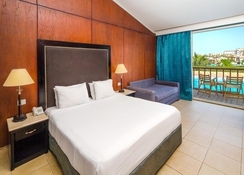 The guests of Caesar Palace Hotel & Aqua Park can use the facilities of Hawaii Le Jardin Resort which is a 7-minute car journey away, except the bars and the restaurants. What a lovely resort ,the food was amazing and staff were very helpful. There is a beach on the resort which is so beautiful clear sea water. Def would stay at the Hawaii Rivera resort hurghada. I went dec 2018 with my husband and son.Excellent resort and brilliant hospitality.